Factcheck: Is 3.5 C of Arctic warming 'locked in'? A Carbon Brief analysis shows that a mistaken UNEP press release led some media outlets to err in reporting that most future Arctic warming is 'locked in.' The analysis shows ongoing and future emissions still will play a major role in how much the region warms. A new UN Environment report on the Arctic was released recently covering a broad range of changes to the region’s climate, environment, wildlife and epidemiology. The accompanying press release focused on the report’s section about climate change. * It warned that, “even if the Paris Agreement goals are met, Arctic winter temperatures will increase 3-5 C by 2050 compared to 1986-2005 levels” and will warm 5-9 C by 2080. However, an investigation by Carbon Brief has found that the section of the report on climate change erroneously conflates the Paris Agreement target – which is to limit warming to “well below” 2 C by the end of the century relative to pre-industrial levels – with a scenario that has much more modest emission reductions which result in around 3 C of global warming. In climate-model runs using a scenario limiting global warming to below 2 C, the Arctic still warms faster than the rest of the world. But future Arctic winter warming will be around 0.5-5 C by the 2080s compared to 1986-2005 levels, much lower than the 5-9 C values stated in the report. This means that much of the future warming in the Arctic will depend on our emissions over the 21st century, rather than being “locked in” as the report claims. The UN Environment report, “Global linkages: A graphic look at the changing Arctic,” provides a brief, accessible and infographic-heavy look at a number of different areas in which the Arctic has changed in recent decades and may change in the future. Warmer temperatures in the Arctic resulted in a record low in the winter sea ice extent between 2015–2018 (Overland et al., 2018). Indeed, under a medium- or high-emission scenario, projected temperature changes for the Arctic will follow a winter warming trend at least double the rate for the northern hemisphere (AMAP 2017a). This means that even if countries manage to cut GHG emissions to the targets outlined in the 2015 Paris Agreement on climate change, winter temperatures in the Arctic will still be 3 to 5 C higher by 2050 and 5 to 9 C higher by 2080, relative to 1986–2005 levels. In fact, even if we stopped all emissions overnight, winter temperatures in the Arctic will still increase by 4 to 5 C compared to the late twentieth century. This increase is locked into the climate system by GHGs already emitted and ocean heat storage (AMAP 2017a). While the first two sentences are accurate, problems begin in the third when the report argues that meeting Paris Agreement targets would still result in winter Arctic warming of 3-5 C by 2050 and 5-9 C by 2080, relative to 1986-2005 levels. Over the Arctic Ocean, which is ice-free in early winter in some models and covered by thin sea ice during late winter, the warming is 3–5 C by mid-century and 5–9 C by late century under RCP4.5. Glossary. RCP4.5: The RCPs (Representative Concentration Pathways) are scenarios of future concentrations of greenhouse gases and other forcings. RCP4.5 is a “stabilisation scenario” where policies are put in place so atmospheric CO2 concentration levels off around the middle of the century, though temperatures do not stabilise before 2100. These policies include a shift to low-carbon energy technologies and the deployment of carbon capture and storage. In RCP4.5, atmospheric CO2 sits at 540 ppm by 2100 – roughly 140 ppm higher than now – equivalent to 630 ppm once other forcings are included (in CO2e). 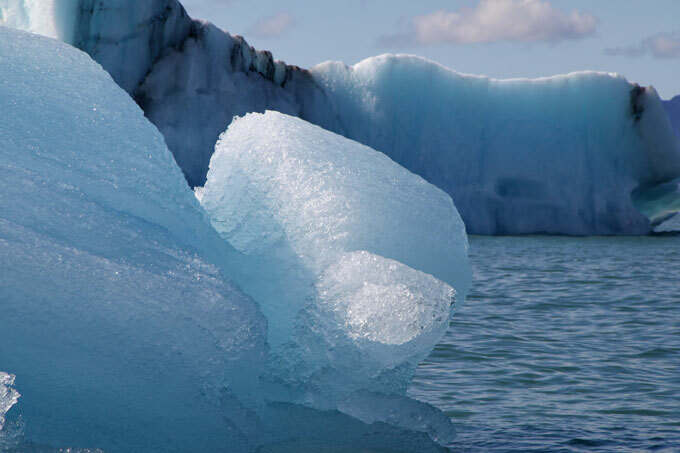 By 2100, global temperatures are likely to rise by 2-3 C above pre-industrial levels. The UN Environment report drops the reference to the Arctic Ocean, referring to these warming projections as “winter temperatures in the Arctic” – a much larger area of the Earth than just the region over the Arctic Ocean. The actual warming in RCP4.5 for the full Arctic (between 60N and 90N) in the 2017 AMAP report is a bit lower: around 3.8-7.8 C in the 2080s. There is another minor issue where the new report gives specific years (2050 and 2080), while the 2017 AMAP report actually uses the periods from 2050-2059 and 2080-2089. Glossary. RCP8.5: The RCPs (Representative Concentration Pathways) are scenarios of future concentrations of greenhouse gases and other forcings. RCP8.5 is a scenario of “comparatively high greenhouse gas emissions” brought about by rapid population growth, high energy demand, fossil fuel dominance and an absence of climate change policies. This “business as usual” scenario is the highest of the four RCPs and sees atmospheric CO2 rise to around 935 ppm by 2100, equivalent to 1,370 ppm once other forcings are included (in CO2e). The likely range of global temperatures by 2100 for RCP8.5 is 4.0-6.1 C above pre-industrial levels. The release of the Shared Socioeconomic Pathways (SSPs) has introduced a number of additional “no-new-policy” scenarios, meaning RCP8.5 is no longer the sole option available to researchers as a high-end no-mitigation pathway. In the Paris Agreement, countries set a target to limit warming “well below” 2 C, with an aspirational target of limiting warming below 1.5 C. However, the 2017 AMAP report only considers two future emissions scenarios: a very-high-emission RCP8.5 scenario, where the world experiences more than 4 C warming; and a medium-emission RCP4.5 scenario, where the world experiences around 3 C warming compared to pre-industrial levels by the end of the century. If countries were to meet the Paris Agreement target of limiting warming to “well below” 2 C, global emissions would actually follow a RCP2.6 scenario (or cut emissions even more quickly to limit warming to 1.5 C). 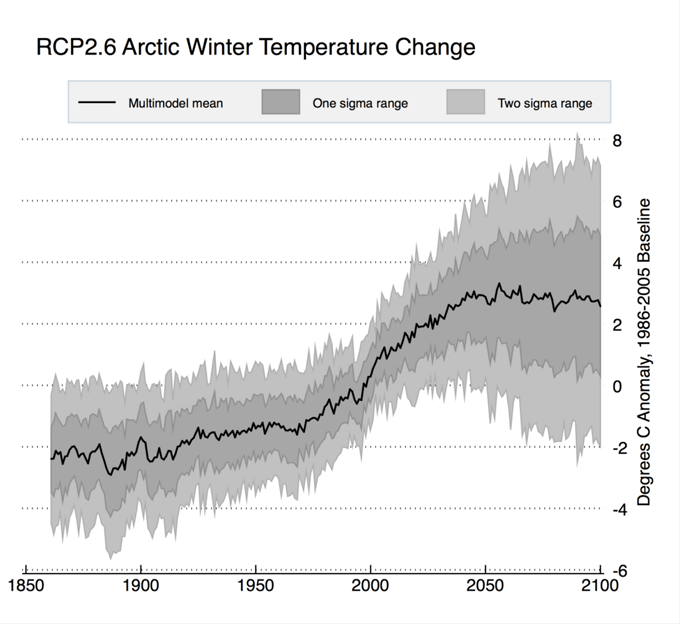 While RCP2.6 still sees some additional Arctic warming, it is much smaller than the numbers contained in the report. In a scenario where the Paris Agreement target is met, the actual winter warming projected for the Arctic is 0.8-4.5 C in the 2050s and 0.5-5 C in the 2080s relative to 1986–2005 levels (following the approach used in 2017 AMAP report of giving one-sigma ranges). The multi-model mean shows 2.8 C warming in both the 2050s and 2080s, as falling global emissions limit further warming after the middle of the century. The statement in the report that “even if we stopped all emissions overnight, winter temperatures in the Arctic will still increase by 4 C to 5 C compared to the late twentieth century” is puzzling, as it does not appear anywhere in the 2017 AMAP report that it cites. According to an analysis featured in the recent IPCC special report on 1.5C, reducing all human emissions of greenhouse gases and aerosols to zero immediately would result in a modest short-term bump in global temperatures of around 0.15 C as Earth-cooling aerosols disappear, followed by a decline. Around 20 years after emissions went to zero, global temperatures would fall back down below today’s levels and then cool by around 0.25 C by 2100. While reducing aerosols might have a larger warming impact in the Arctic than other regions, an additional long-term warming of 4C to 5C seems rather unlikely. Why might the report conflate a 3 C global-warming scenario (RCP4.5) with the Paris Agreement target (RCP2.6)? The actual commitments made by countries in the Paris Agreement – the nationally determined contributions (NDCs) – fall well short of what would be needed to meet the Paris target. If countries only take these actions – and do not ratchet up their commitments after the Paris commitment period ends in 2030 – studies suggest that the world would be on track for a bit more than 3C warming, though how much depends largely on assumptions around emissions between 2030 and 2100. However, even if the report meant to say “the warming implied by existing Paris commitments” rather than the “Paris targets,” the press release and subsequent media coverage are still misleading. Unless the authors are arguing that the world as a whole is already locked into 3 C warming – and there are plenty of scenarios that would keep global warming below 2 C, or even down to 1.5 C warming – the amount of future warming that will occur in the Arctic during the 21st century will depend in large part on our future emissions. 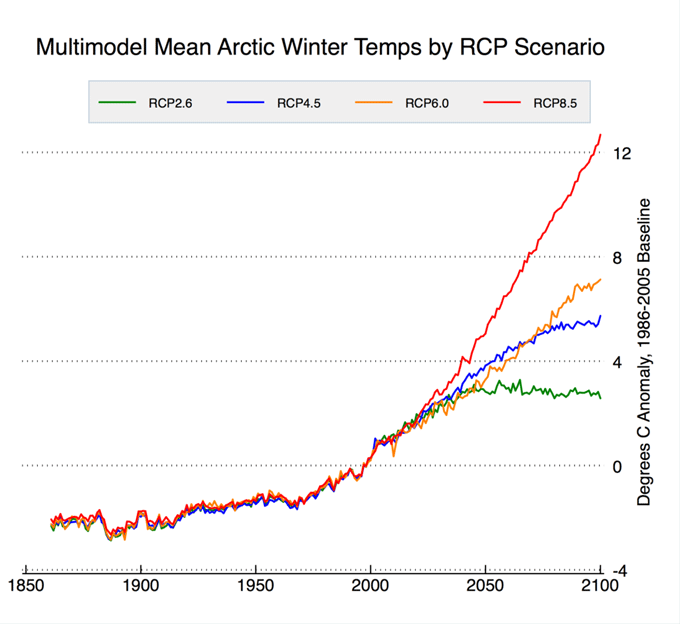 The figure below shows the winter Arctic warming relative to 1986-2005 from the average of all the IPCC CMIP5 climate models for each future RCP emission scenario. There is a wide range of potential future warming, from as little as 2.7 C in 2100 in RCP2.6 to as much as 12 C in RCP8.5. Which of these future warming scenarios will occur depends largely on our greenhouse gas emissions over the rest of the 21st century. If the world actually meets the Paris target of limiting warming below 2 C, the future Arctic winter warming will be around 0.5-5 C, much lower than the 5-9 C values stated in the report. *Editor’s note: In response to this factcheck and feedback from other experts, the UN Environment report and press release were both updated to correct the issues raised. The original factcheck is published here. Reprinted with permission of Carbon Brief.